Senate Democrats are weighing whether to bring the chamber's business to a halt next week in an effort to voice their objections to the GOP health care push, according to sources familiar with the effort. If it were possible though, I would have expected the Republicans to have tried it at some point or another over the last 30 years. I'm seeing things that have been referred to as a "blockade," like with Merrick Garland last year, but that was subject to the filibuster at the time. In theory (though the Senate parliamentarian has not weighed in on this, as far as I know), the AHCA can use the reconciliation process to only need 50 votes to pass. In any case, this is not a reason not to do it. 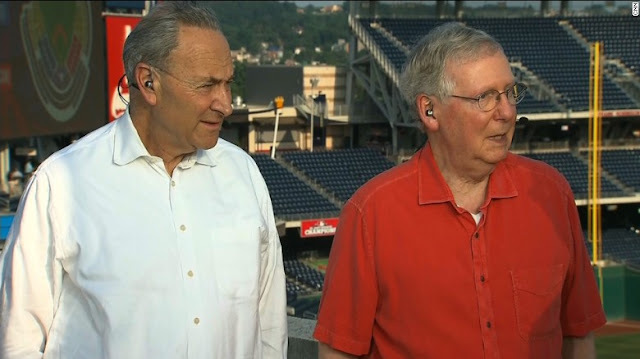 One Democratic source cautioned that the caucus may not go that far given the bipartisan atmosphere following the shooting at a congressional baseball practice Wednesday. The Republicans would gladly shoot your "bipartisanship" in the head, Democrats. Don't fall for it.